Who would place the Bible in their list of Ten Favorite, Formative, or Otherwise Books? I thought about it. I thought harder about individual books of the Bible. The Jewish/Christian combination is really more of a library than a book. That’s not a cop-out. 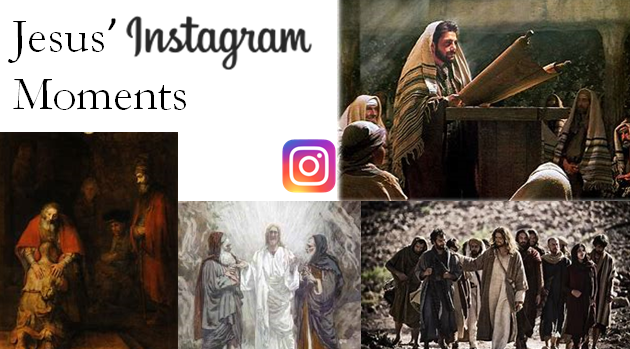 Another interesting challenge to me was from the members of the parish Bible Study I’ve been leading this winter, Jesus’ Instagram Moments. After next week’s last session, we’re on hold till May. What do you suppose the suggestions for the next topic were? Would you believe Proverbs, Sirach, and Wisdom? That surprised me. One of the people asked if I ever considered doing a class on Church doctrine. Anyway, my facebook challenge is coming to a close. Formative book #9 I’ve blogged about here already. Number ten, to be posted tomorrow, still up-in-the-air. Maybe I will post on the Bible. The Spiritual Exercises have been as formative as any book, but I have to admit I’ve read that in concert with various commentaries, plus the real formative experience was doing the nineteenth annotation in real life. You readers, any formative books on your mind? Something recent? something still with you after all these years? This entry was posted in Parish Life, Scripture. Bookmark the permalink.